Nominal income inequality has been on the rise in the US and many other countries, attracting the sustained attention of policymakers and the general public (Piketty and Saez 2003, Acemoglu and Autor 2011). In this context, a recent and growing literature has documented the role of heterogeneity across firms (employers) within sectors in accounting for the observed inequality of nominal earnings across workers in the economy (e.g. Bloom et al. 2017, Helpman et al. 2017, Card et al. 2013). (1) To what extent do rich and poor households source their consumption baskets from different parts of the firm size distribution? (2) How can we explain these differences? (3) What are the implications of our answers to (1) and (2) for real income inequality? To answer these questions, we proceed with four main steps. First, using detailed matched home and store scanner consumption microdata, we document large and significant differences in the weighted average firm sizes that rich and poor US households source their consumption from, and explore alternative explanations. Second, to rationalise these findings we develop a tractable quantitative model that combines heterogeneity across firms in production and consumers on the demand side. Third, we calibrate the model using the microdata, and quantify the channels underlying the observed stylised facts. Fourth, we explore model-based general equilibrium counterfactuals to illustrate how, in a setting where households source their consumption from heterogeneous firms, economic shocks (such as trade integration or business regulations) can give rise to asymmetric effects on cost of living inflation across the income distribution. Using these data, we estimate large and statistically significant differences in the weighted average firm sizes that rich and poor households source their consumption from. This finding holds across the different product departments covered by the Nielsen data and for all half-year periods in the dataset. As shown in Figure 1, we find that the richest 20% of US households source their consumption from, on average, 20% larger producers of brands within disaggregated product groups compared to the poorest 20% of US households. As we see in Figure 1, these differences in weighted-average firm sizes become larger if we compare the top decile to the bottom decile. We also document that the rank order of household budget shares spent on different producers within a product module is preserved across the income distribution – i.e. the largest firms command the highest budget shares for all income groups. Moreover, as documented in previous studies, we observe that large firms tend to sell at higher prices, indicating that they also tend to sell higher-quality products. Note: The figure depicts deviations in weighted average log firm sales embodied in the consumption baskets of on average 59,000 US households during 18 half-year periods between 2006-14. The y-axis displays weighted average deviations in log producer sales within more than 1000 product modules where the weights are household expenditure shares across producers of brands. The x-axis displays national percentiles of per capita total household retail expenditure per half year period. The fitted relationship corresponds to local polynomial regressions. Standard errors in both graphs are clustered at the county level, and the displayed confidence intervals are at the 95% level. After exploring a number of alternative explanations using the richness of the data, we interpret these stylised facts as equilibrium outcomes through the lens of a quantitative model with two-sided heterogeneity, where both consumers and firms optimally choose their product attributes. In our framework, rich and poor consumers are allowed to differ in their sensitivity to prices, and in how they value product quality. On the production side of the model, firms have different levels of productivity and choose their prices and product quality attributes in a setting where these choices endogenously determine the composition of heterogeneous consumers buying from them. We then use the microdata to estimate the preference and technology parameters. These estimates reveal two opposing forces that, in equilibrium, determine both firm sizes across consumption baskets and the sorting of firms across product quality attributes. On the one hand, larger firms offer lower quality-adjusted prices, which increases the share of their sales coming from more price-sensitive lower-income consumers. Since these consumers value quality relatively less, this channel, ceteris paribus, leads poorer households to source their consumption from on average larger firms that, in turn, choose to produce at lower quality. On the other hand, we estimate economies of scale in the production of higher-quality goods, which gives larger firms incentives to sort into higher product quality, catering to the taste of wealthier households. Empirically, we find that this second channel dominates the first, giving rise to the endogenous sorting of larger, more productive firms into products that are valued relatively more by richer households. These findings have implications for real income inequality through asymmetric effects on household price indices. Economic shocks affect heterogeneous firms differently, in a setting where it is now also the case that rich and poor households source their consumption baskets from different types of firms. In the final step, to illustrate this point, we use the calibrated model to explore a number of general equilibrium counterfactuals that explore the distributional consequences of changes in nominal income inequality, trade liberalisation, and business regulations/taxes. 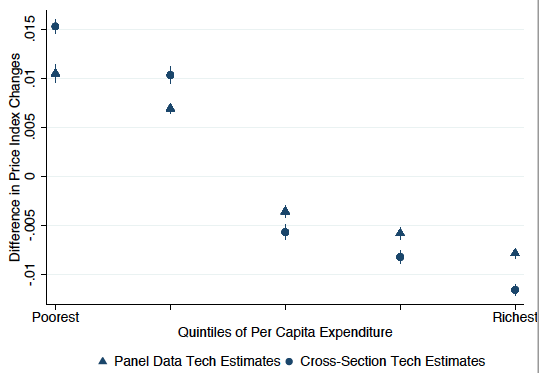 Notes: “Panel-data” and “cross-section” technology parameter estimates refer to different empirical strategies to identify the degree of economies of scale in the production of product quality. As explained in more detail in Faber and Fally (2017), we regard the panel-data estimates as more conservative. Confidence intervals at the 95% level are based on robust standard errors across 18 six-month periods. See Faber and Fally (2017) for bootstrapped standard errors. Figure 2 displays the estimated difference in household cost-of-living inflation between the rich and poor US households, due to a 10% increase in import penetration between two symmetric countries. We do this in an otherwise standard Melitz (2003) framework, in which distributional effects would be zero in the absence of the price index effects that we study. We find that this moderate trade liberalisation leads to a 1.5-2.5% lower cost-of-living inflation in retail consumption for the richest 20% of US households compared to the poorest 20%. The findings from our counterfactual analyses illustrate a rich new interplay of adjustments that arise in the presence of two-sided heterogeneity. We find that these effects amplify observed changes in nominal inequality over time, lead to a more regressive distribution of the gains from international trade, and give rise to new distributional implications of business regulations. Overall, our findings suggest that firm heterogeneity affects real income inequality in more complex ways than solely through nominal earnings of workers, which have been the focus of the existing literature. Empirically, our findings emphasise the importance of capturing asymmetric changes in price indices at a granular level of product aggregation for both the measurement of overall changes in real income inequality over time, as well as for studying the effects of policy shocks, such as trade or the introduction of regulations, on inequality. Acemoglu, D, and D Autor (2011), “Skills, tasks and technologies: Implications for employment and earnings”, Handbook of Labor Economics, 4, 1043-1171. Bloom, N, J Song, D J Price, and F Guvenen (2017), “Firming up inequality”, NBER Working Paper. Card, D, J Heining, and P Kline (2013), “Workplace heterogeneity and the rise of West German wage inequality”, The Quarterly Journal of Economics, 128 (3), 967-1015. 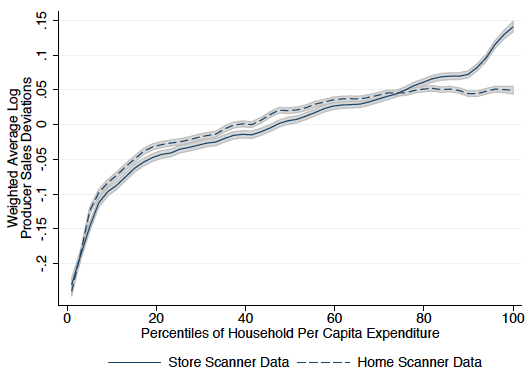 Faber, B, and T Fally (2017), “Firm Heterogeneity in Consumption Baskets: Evidence from Home and Store Scanner Data”, Berkeley University Working Paper. Helpman, E, O Itskhoki, M-A Muendler, and S J Redding (2017), “Trade and inequality: From theory to estimation” Review of Economic Studies, forthcoming. Hsieh, C-T, and P J Klenow (2009), “Misallocation and manufacturing TFP in China and India”, Quarterly Journal of Economics, 124 (4). Melitz, M (2003), “The impact of trade on intra-industry reallocations and aggregate industry productivity” Econometrica, 71 (6), 1695-1725. Piketty, T, and E Saez (2003), “Income inequality in the United States, 1913-1998”, The Quarterly Journal of Economics, 118 (1), 1-41. The Nielsen data are made available through an academic user agreement with the Kilts Center at Chicago Booth.